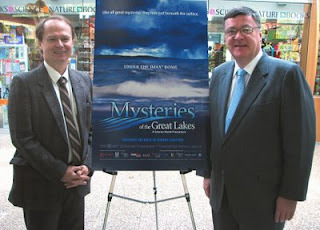 Cut line: Science North’s David Lickley and Jim Marshbank flank a poster for their new made-in-Canada Imax movie Mysteries of the Great Lakes. Canadian actor, Gordon Pinsent, narrates the documentary. Photograph by Dave Tollington. For the Canadian makers of the Mysteries of the Great Lakes, Imax film, the sturgeon is one of Lakes’ biggest mysteries of them all. For divers attending this made-in-North Bay, large format movie, it is all about wondering how the underwater cinematography is so good! Now playing in Science Centres and Museums across North America, Mysteries of the Great Lakes take audiences on a journey from the tip of Lake Superior to the edge of Lake Ontario to witness the lakes’ breathtaking beauty – both above and below the water. The movie perhaps should have been more accurately named “A Big Fish Story” because much of the movie looks at the enigmatic sturgeon and how civilization is threatening this strange long living beast. Science North (Sudbury’s Science Centre and producer of the movie) estimates that there are only 20,000 sturgeons living in the Great Lakes as compared to millions before European contact. After 150 million years on the planet (predates the dinosaur), the species had been brought to the brink of extinction through over-fishing for fish oil and caviar. The movie features an IMAX first – up close underwater segments of the shy giant sturgeon. It also shows audiences albeit briefly, an eerie, under water footage of the Edmund Fitzgerald (accompanied by the song of the same name by Gordon Lightfoot - as prominently displayed in all the promotional material). 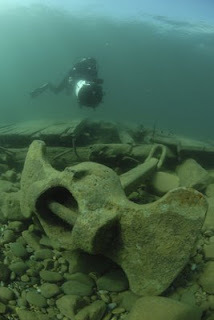 The film also goes underwater to look at shipwrecks near the Bruce Peninsula in Lake Huron. Jim Marshbank the Executive Producer of the movie attended the premier of the movie at the Ontario Science Centre in Toronto. He told Diver that the film company is in the process of placing the documentary with 70 theatres world wide, including the Smithsonian Institute in Washington, DC.